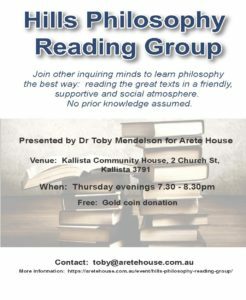 Arete House is currently hosting a fortnightly philosophy reading group at Kallista Community House, on every second Thursday night 7.30-9.00pm. There is no cost, but we offer a gold coin donation to the house. And on 11/4/2019 we will begin Plato’s Republic. If you wish to join, please email Toby Mendelson: toby@aretehouse.com.au.